Blog What Is Ebb And Flow Hydroponics? Ebb and flow hydroponics, also known as flood and drain hydroponics, is often associated with aquaponics, since the growing medium can be used as a bio-filter for fish waste nitrates. But for plant growers who are not ready to bring live fish into their gardening routines, this type of hydroponics is great intermediate-level system that can support a greater variety of plants than other hydroponics systems can. 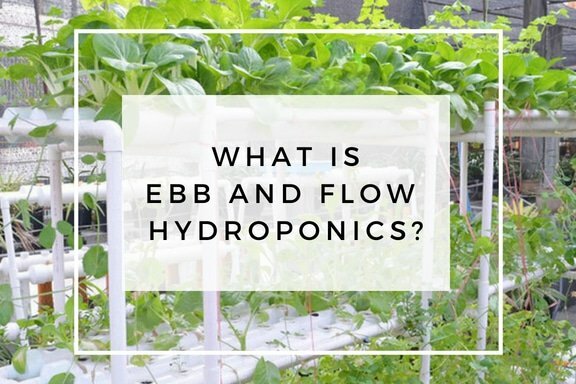 Ebb and flow hydroponics is a system of soilless plant cultivation that delivers water, nutrients, and oxygen to the roots of plants in cycles that consist of flooding the growing medium with water-based nutrient solution and then draining the liquid and allowing the medium to dry out. The main principle behind ebb and flow hydroponics is that the intermittent flooding occurs in cycles that allow the growing medium to dry out between them. The plants benefit from this short dry period because it forces their roots to grow in search of moisture; and the more a plant’s root system grows, the better it can absorb nutrients – and the faster and healthier the plant will grow! How Does An Ebb And Flow Hydroponics System Work? The most basic ebb and flow hydroponics system consists of a growing container holding the growing medium and the plants, and directly beneath it, a nutrient solution reservoir, which contains a pump that’s attached to a timer. The pump turns on according to the settings of the timer, sending nutrient solution up to the growing container through a hole in the bottom of it. The level of the solution is regulated by an overflow tube, which empties into the reservoir below. So the liquid in the growing container will rise to the level of the overflow tube and remain at that level as long as the pump continues to circulate solution up to the tank while the overflow tube sends solution back to the reservoir in equal measure. Then, when the timer turns the pump off, the liquid in the growing container is allowed to drain slowly back into the reservoir via the original tubing that brought it up. There are several variations on this simple theme that allow you to create a system with multiple growing containers, one of which involves a second pump. Why Choose Ebb And Flow Hydroponics? Flood and drain systems are popular hydroponics systems for several reasons, not the least of which is that they are quite easy to build. And because you don’t need any pricey specialize components for a basic ebb and flow hydroponics system, you can put one together using inexpensive, everyday materials. If you don’t have a lot of space available, a simple ebb and flow hydroponics system can be quite compact, with the reservoir located right below the growing container. However, these systems are scalable and adaptable to different growing needs. Another advantage is resource efficiency, since you are recycling the nutrient solution through the system rather than just running it through once then discarding it. This means you can let the automated system run itself for several days or weeks at a time, as long as it is set to meet the needs of your plants at their current stage of their growth cycle. But perhaps the biggest advantage of ebb and flow hydroponics is that you can achieve success with plants that don’t do so well in other hydroponic systems, such as cucumbers, beans, tomatoes, and other medium-to-large sized plants. Plants that are in their flowering and fruit-bearing stages respond particularly well to the practice of allowing the roots to dry out between irrigation cycles. What Are The Disadvantages Of Ebb And Flow Hydroponics? Is Ebb And Flow Hydroponics Suitable For Beginners? Despite the easy setup, ebb and flow hydroponics is generally considered an intermediate-level hydroponics system. The basic principle of flooding, draining, and allowing the medium to dry out between cycles may seem simple, but in practice, it can be tricky to get the timing right, as it will depend on the ability of the growing medium to hold moisture as well as the changing needs of your plants. Ideally, you want to allow the plants to dry out between flood cycles to reduce the risk of overwatering. However, determining the perfect timing of your flood and drain cycles will depend on a whole range of factors, including the growing medium, the stage and rate of plant growth, plant variety and the environmental conditions. Therefore, you will need to experiment a bit to get a good feel for the cycle timing, keeping in mind that plants consume more water and nutrients as they grow larger. In general, you’ll need to monitor the pH and nutrient levels of the solution, top up the reservoir as necessary, and change out the solution every week or two. Periodically flushing out the medium with plain water is also a good practice with any recirculating system. Here, you’ll find a brief discussion of each of these components, followed by descriptions of the different types of flood and drain hydroponics systems. For the growing container in a basic ebb and flow hydroponics system, you can either place your growing medium and plants directly into the container, or you can have your plants in separate gardening pots and allow the growing media to wick up the solution from the bottom of each pot. The downside of having your plants all growing together in the container is that the roots can become entwined, making it difficult to remove the plants for transplanting or cleansing your medium of pathogens that can develop. Regardless of which option you choose, your growing container will need to have two holes in the bottom: one for the inlet/outlet tube, and the other for the overflow tube.The holes should be at the far ends of the container from each other to ensure circulation of the nutrient solution for the period when the pump remains running after the system is fully flooded. You should also make sure the inlet/outlet tube can function properly as a drain, meaning you may need to have your growing container set at a slight tilt to ensure that this is the lowest point. The growing media that work best with ebb and flow hydroponics systems are those that drain well, can support your plants, and don’t hold too much moisture. Remember, the roots need to dry out between flooding cycles. Clay grow stones are a popular choice, although rockwool and rinsed gravel or sand can also work well. Or, consider using a combination of coco coir chips, to aid nutrient delivery during the drying part of the cycle, with a layer of river rocks placed at the bottom for drainage. Perlite can also be an appropriate medium, but only if your plants are potted individually, as this material is too buoyant for the ebb-and-flow action of the liquid in a larger growing container. Your reservoir should be made of an opaque material, to avoid algae and bacteria growth. In a basic ebb and flow system, the reservoir is located directly below the growing container, so a more shallow container will work best. The reservoir size will depend on the size of your growing operation and the type of plants you wish to grow. You may need an air pump and air stone in your reservoir to make more oxygen available to the plant roots, if you are using a medium that doesn’t provide great aeration, such as sand, or if your reservoir is not directly beneath the growing container, which allows the flow from the overflow pipe to serve up a little aerating action. Inside the reservoir, you have a submersible pump. By having it located directly underneath the growing container, you are minimizing the vertical distance that the nutrient solution must be pumped. So you can use a simple pond or fountain pump, as long as it has a strong enough flow rate to fill the growing container in a short period of time. You don’t need a high-accuracy timer for these hydroponics systems. A regular irrigation timer will do just fine, since the flood and drain cycles don’t need to be timed to the second. The overflow tube determines the maximum level of nutrient solution in the growing container. In the standard ebb and flow system arrangement, it can simply be a single straight tube set at the height you want the solution to rise above the bottom of the growing container and allowing the liquid to fall back into the reservoir below. However, you might want to place a T connector at the top that will pass liquid from the side and allow air into the pipe from the top to make sure it drains smoothly. This tube leads from the pump to the bottom of the growing container and serves to both deliver the nutrient solution to the container and to drain the container after the pump is turned off. The diameter of this tube should be smaller than that of the overflow pipe, to ensure that you aren’t pumping in more water than what flows out while circulating the liquid for a short time after the maximum level has been reached. As mentioned above, there are several variations on the basic ebb and flow hydroponics system described in the previous section. They involve multiple growing containers and a second pump. A multiple growing container single pump system is designed with plumbing that delivers nutrient solution to each grow tray through piping running below the containers that has T connectors sending the solution up to the bottom of each one. The containers will fill up with solution all at the same time, rising to the level determined by an external overflow pipe that bends back down and allows the liquid to pour back into the reservoir that’s located below it. Since this type of flood and drain system depends on gravity to return the solution to the reservoir, the containers must be situated so they are higher than the reservoir. This variation of ebb and flow hydroponics is meant for growing larger plants, as it allows for more vertical space by having the growing containers located on the floor rather than needing to be raised up above the reservoir. Instead of depending on gravity to drain the solution out of the growing containers, this system requires a second pump that’s located inside a surge tank, which is a smaller container that will regulate the solution level across all the growing containers. In this design, the nutrient solution reservoir contains a pump with a timer, as in the other systems; but here, the solution is sent into the surge tank when the pump is turned on. The surge tank feeds all of the growing containers from lines that enter them at or near the bottom, so the level of the liquid will remain the same across all of them. The liquid will rise until it reaches the level set by a float valve in the surge tank, which turns on a secondary pump that sends the solution back into the reservoir. Both pumps will run for a short period to circulate the liquid, until the timer turns the main pump off. The surge tank pump, however, will continue to run, and the liquid level in the growing containers and surge tank will fall until it reaches a second float valve at the bottom of the surge tank that turns the secondary pump off. The containers have now been drained. Are There Ebb And Flow Hydroponics Systems Available To Buy? Active Aqua’s Grow Flow surge tank ebb and flow system is very versatile, efficient, and reliable. The Viagrow Complete Ebb and Flow Hydroponic System is another good option for those who want to jump right in and get started planting. You’ll also want to check out the complete ebb and flow systems offered by Oxygen Pot Systems. What Soil Do Cactus Need?